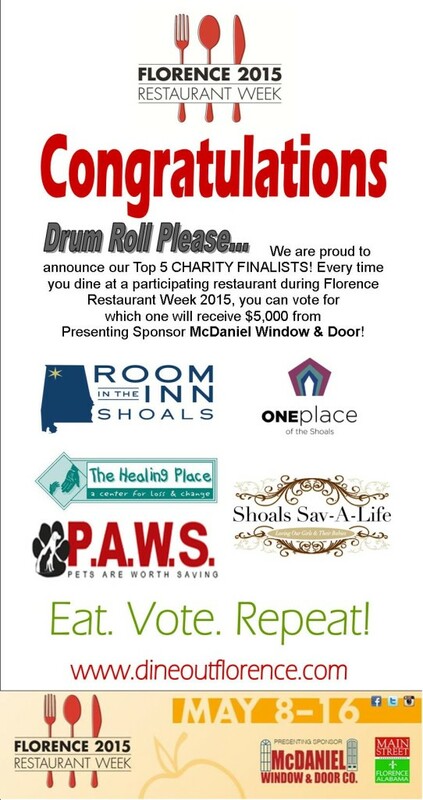 When you eat at the participating restaurants of Florence Restaurant Week make sure you ask for a ballot and vote for your favorite charity. The winner will receive $5000 from McDaniel Window and Door Co. Go Vote Today! You can check out the charities with the links below. Categories: Food Review | Tags: #DineDowntown, #FRW2015, alabama, buy local, charity, eat local, florence alabama, florence main street, One Place of the Shoals, P.A.W.S, Room in the Shoals, Shoals Sav-A-Life, The Healing Place | Permalink.